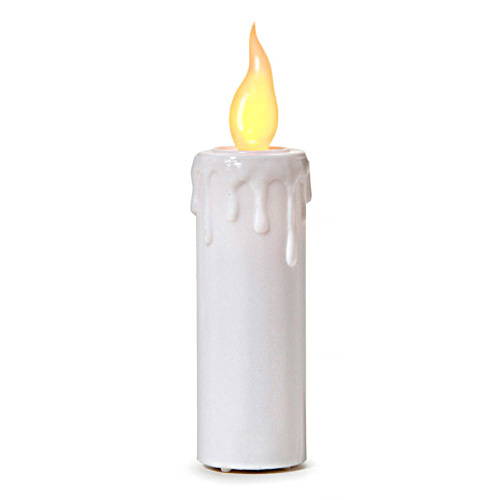 BATTERY CANDLES are available in Flickering and Steady-Burning styles. Bulbs included. Great for Florals, Holidays, Carolers, Choirs, etc. Candle "B" has on-off switch on its bottom. Style "A" Battery Candle Fits In Standard Candle Holder. A) LED BATTERY CANDLE Flickers like a real candle flame with a warm amber light. Antique ivory plastic. Silicone dipped bulb. 6-3/4"H overall x 7/8" diameter tapering to 9/16". Candles use 2AA batteries (NOT included). Pkg. of 2. *Works up to 300+ Hrs. B) LED BATTERY CANDLE Flickers like a real candle flame with a warm amber light. White plastic. Silicone dipped bulb. 4"H overall x 1" diameter. Needs 2 AAA size batteries (NOT included). Package of 1. *Works up to 250+ Hrs. Flickers like a real candle flame with a warm amber light. Antique ivory plastic. Silicone dipped bulbs. 6-3/4"H overall x 7/8". Uses 2 AA batteries per candle. (Batteries NOT included. )Package of 2. *Works up to 300+ Hrs. LED BATTERY CANDLE Flickers like a real candle flame with a warm amber light. White plastic. Silicone dipped bulb. 4"H overall x 1". Needs 2 AAA size batteries (NOT included). Package of 1. *Works up to 250+ Hrs. TEALIGHT BATTERY CANDLES are also available.